The AUDEEN features classic styling and rugged construction. This is a perfect ski and utility boat in one. 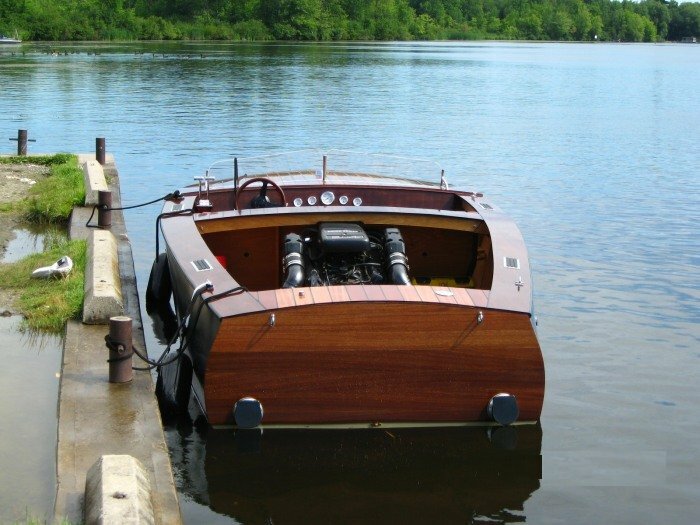 Constructed from sheet plywood for light weight and ease of construction, the hull is both dry and quick and just the right size for easy trailering. 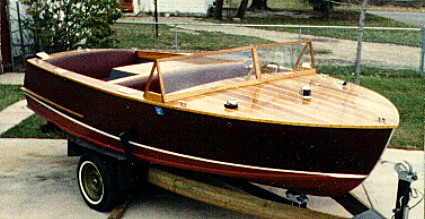 The current interest in classic runabouts has led many builders to finish AUDEEN with highly varnished mahogany decks and cockpit trim. Power can be just about any converted lightweight auto engine coupled with a time proven straight shaft set-up. The most common installation being a small block Chevy V-8. Of course, off the shelf marinized inboards can be used as well. Just about any amateur can build this roomy boat using Glen-L Plans and full size Patterns. Design History Note: The "Aud-een" was named after a girl named Audry Green who the designer, Glen L. Witt, dated for quite a few years. "This is the third of four Glen-L designs I have built. 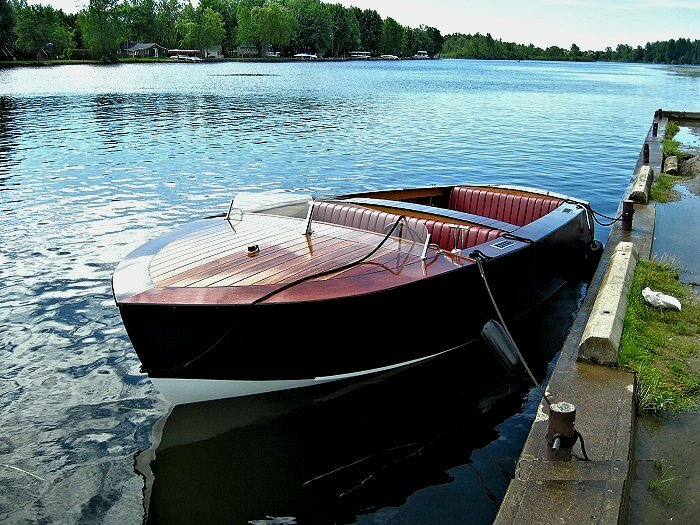 The Audeen has mahogany frames, decks, cabin trim and motor cover. The longitudinal battens are oak with stiffeners. The sides are 3/8" and the bottom 3/4" marine plywood. It is powered with a 283 V/8 engine. The boat was completed in 1988 and is still pristine and being used regularly. The hardware, including the windshield brackets are from a 1954 Chris. 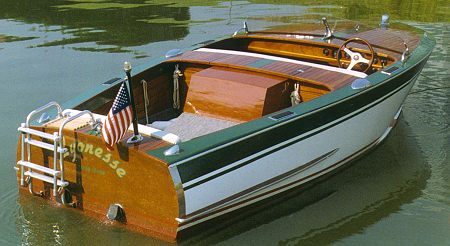 It performs great and has won numerous awards at local wooden boat club shows, including the Skipper's Choice Award." "At the launch, notwithstanding the many things that could have gone wrong, the day was a complete success and probably one of the most exciting during my lifetime. The Audeen ran well and was very, very quick. The appearance of the boat drew many admirers and of course my wife and I were more than happy to explain just what was happening. People felt that they were also part of something very special." Hull weight (approx.) 800 lbs. 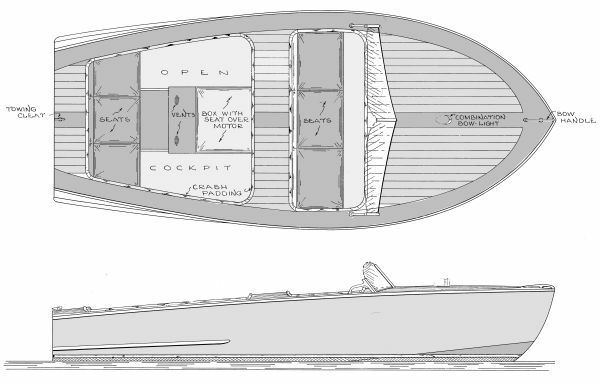 COMPLETE PLANS include FULL SIZE PATTERNS for the stem, breasthook, transom knee, and half-section patterns for each of the frames and transom. Includes instructions, Bill of Materials, and Fastening Schedule.